The sketch today on Splitcoast (SC535) seemed pretty easy and digging through my stash of stuff, I came across this poppy. It was already stamped on a watercolor background and I thought it might work out for the sketch. I did use a water brush to “lift” a bit of the color in areas on the poppy for highlights. I just think it adds a bit more depth to the image. I die cut it with a mega oval then decided I wanted it a little smaller, but in order to make it smaller I had to do a little out of the box with it. After adding a black mat, I thought it looked a little too small, lol. So I attached it back on top of the layer I cut it out of originally. For the divided background panel, mine is not actually 2 panels..just one panel divided by a black strip. Down the left side, I die cut the grid and added some of the leftover water color pieces. On the right, I embossed it w/ a cherry blossom folder and used little punched circles for the centers. Since there isn’t a lot of space left, I didn’t add a greeting. I made this for Joanne’s fabulous Dare to Get Dirty 2012 Challenge! Check out all the Challenge details here: DTGD12Basilefamily. For my colorful card, I started by making a background on water color paper with Peerless water colors. The colors were put down in a random, almost haphazard way and when it dried, I picked an area and stamped this wonderful Poppy image (Blockheads) with black ink. I was going to leave it w/ the background, but it didn’t stand out enough, so I ended up fussy cutting it and attaching it to a white die cut panel. 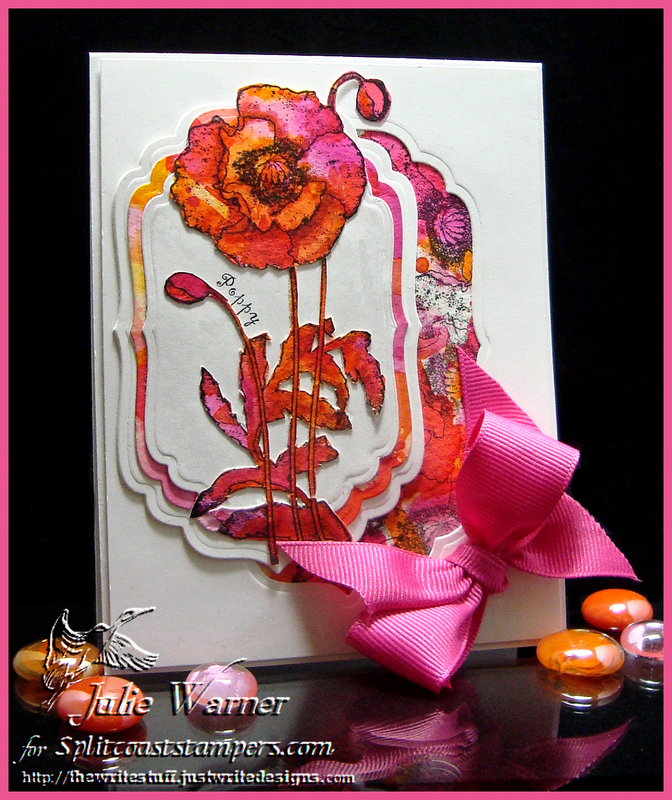 After figuring out where the poppy would be, I stamped just the word “poppy” onto the white bg. The layer behind it more of the plain water color bg, then another white layer. 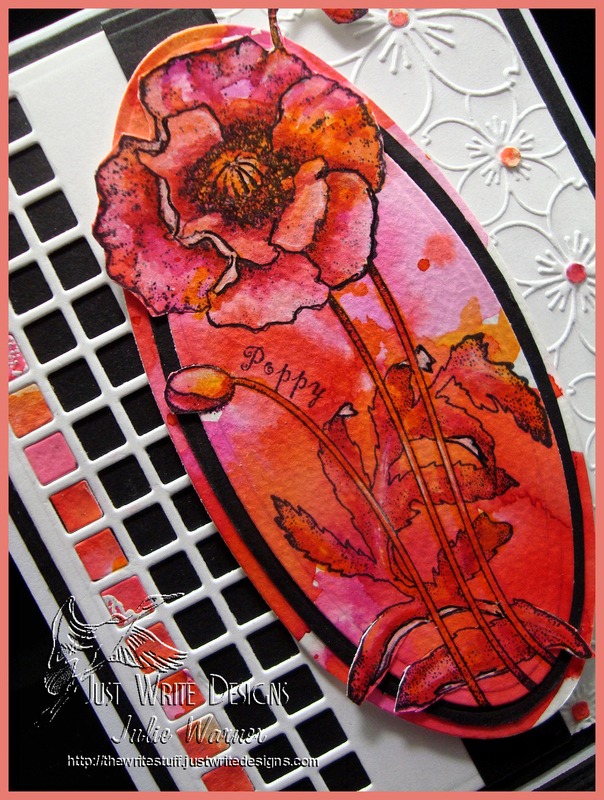 For the final water color bg, I stamped a few of the different poppy images from the set before die cutting it. 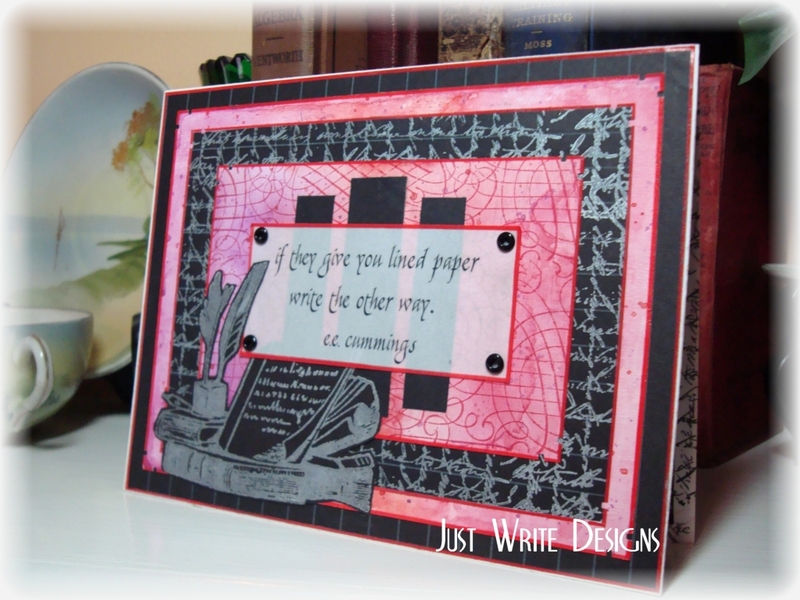 I added a bright pink bow and my 4.25 x 5.50 card was finished. Thanks so much for stopping by! I hope you have a chance to play in the Dare to Get Dirty Challenges this week. Lots of fun, inspiration, chatter and PRIZES! It’s been a long road with many twists, turns and delays but I’m finally here. I’ve been out of town for a while so I don’t have any new cards to post yet. So, I’ll just start off with a tutorial on Watercolor Resist that I put together before I left. Since I don’t have a new card to post just yet, I thought I’d start with the card in my header. 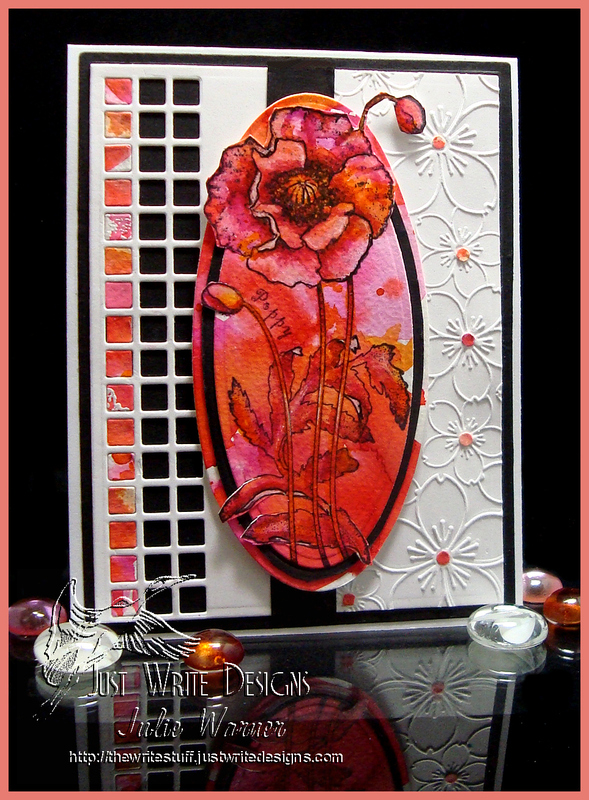 The background of this card was made using the same watercolor technique as the Ombre Watercolor Resist technique, minus the resist part. Write the Other Way was made a few years ago and it was published in The Stamper’s Sampler in an issue that called for quotes or sayings. The stamps used were from Blockheads, Stampers Anonymous and Penny Black; the quote was computer generated onto vellum.